The economy is expected to achieve a higher growth than last year. The projected growth rates range from 4.5 to 5.5 percent. Growth in the global economy is expected to support Sri Lankan exports and enhance industrial growth, while improved weather conditions are expected to revive agricultural output. 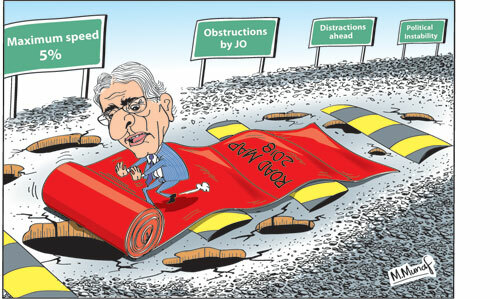 The Governor of the Central Bank, Dr. Indrajit Coomaraswamy, when unveiling the Road Map for 2018 on January 3rd, disclosed that the Central Bank projects the economy to grow by 5 to 5.5 percent this year, from a “shade below 4 percent” in 2017. Although other projections too place it at higher than that of last year’s 4 percent, they are less than 5 percent. For instance the Asian Development Bank expects the economy to grow by 4.7 percent. The ultimate outcome depends on a number of factors that could either spur economic growth or retard it. Not the least of which is the unfolding political environment. The government’s capacity to implement its development policies and global uncertainties would also matter. All three sectors of the economy are expected to grow. Agriculture that was severely affected last year is likely to revive. In the industrial sector, construction is expected to continue growing, while manufacturing is expected to increase owing to growth in manufactured exports. Tourism, that had a slight setback in September and October recovered in November and is expected to grow faster this year, as is the expectation in other services. Agriculture that was adversely affected in the first quarter of last year by continuing drought, and in the second quarter by floods, is expected to achieve higher production. Rice production fell by 53 percent last year and food crop production fell sharply. Tea and rubber output also declined. With good weather conditions expected this year, food crop production is expected to rebound, though non-availability of fertiliser in some parts of the country may restrict paddy production. Tea production that increased in the earlier months of last year, had had a setback in November. Hopefully good weather, availability of fertiliser and weedicides and better prices would increase tea output. While agriculture is likely to contribute positively to growth in 2018, its contribution is not likely to raise GDP by much as its contribution to GDP is less than 10 percent of GDP even in a good year. The growth in industry in recent years has been mainly owing to construction that has been expanding. While the growth in construction is likely to continue, manufacturing is also expected to increase owing to higher exports. This is especially so as exports of garments, the country’s largest export, is expected to grow significantly. Other manufactured exports, such as rubber products, leather goods and ceramics, are also likely to increase owing to better international demand. Sea food exports that have been increasing since the lifting of the EU ban are also likely to increase and contribute to growth this year. While all services are likely to expand, the growth in tourism could make a significant contribution to economic growth and the balance of payments. Tourism that increased in 2017, had a setback in September and October. The resolution of the factors that discouraged tourism should be resolved to ensure a robust growth of tourism. There is a prospect of earnings from information technology (IT) services increasing this year. Earnings of over US$1 billion would be a significant contribution to GDP and the balance of payments. While the global environment is favourable for exports and economic growth, there are several uncertainties, risks and concerns that overhang the 2018 economic performance. These include the likely increase in fuel prices, the unrest and conflicts in the Middle East and political instability of the coalition government. Oil prices are expected to increase this year and perhaps reach US$60 per barrel, but not expected to rise above this as shale oil production in North America is likely to increase when oil prices rise. An increase in oil price would affect fuel import costs as it did last year. An increase in domestic fuel prices would add to inflationary pressures and also the cost of production of many items, especially if electricity tariffs are also increased. This would depress output. However an increase in oil prices would increase incomes of oil producing countries and increase the demand for tea and migrant workers. The continuation of the political upheaval in the Middle East would affect our tea exports, as well as workers’ remittances. If the political violence and conflicts in the region cease it would have an important impact on the balance of payments by increasing workers’ remittances. The political rhetoric leading up to the February 20th provincial councils and local government elections threatens the government’s unity and creates political instability and economic uncertainty that is detrimental to economic growth. Although the breakup of the coalition is unlikely, the disunity and divisiveness of the two coalition partners is harmful to the economy. The unity government’s lack of an economic consensus and consequent uncertainty in economic policies vitiates the implementation of economic policies, especially the much needed reforms. One hopes that soon after the February polls there would be greater solidarity in the unity government that would inspire a new wave of confidence. This would be a decisive factor in the country’s economic performance in 2018 to 2020. Inefficient administration is one of the most serious obstacles to economic development. Much of the success of the economy would depend on the effective implementation of policies. This is particularly so with respect to much needed reforms. There is an urgent need to improve the efficiency of public institutions that have a bearing on investment. While the economic conditions are broadly favourable, the unfolding political developments that increases political instability and uncertainty in economic policies could setback investment, especially foreign direct investment. This year’s economic performance would depend heavily on political stability and the government’s capacity to pursue economic policies without political opportunism. Lack of consensus on economic policies in the government, political considerations and unscientific decision making and constant opposition and obstruction to economic policy implementation could be formidable drawbacks to the economy’s progress in 2018.